I often make myself a little omelet for breakfast–one egg, one slice of ham, fresh herbs and a light sprinkling of cheese. It’s quite petite, compared to the three-egg, cheese-laden heap that arrives when I order an omelet from a restaurant. But it’s the perfect size for me, not to mention filling and delicious. However, even the best breakfasts get a little tiresome after awhile. So last week, in an effort to mix things up a bit, I turned my omelet inside out! I used a ham slice to create a bowl, and filled it with an egg, beaten with a little creme fraiche, dill, Havarti cheese and sliced spring onions–flavors that make my mouth sing. 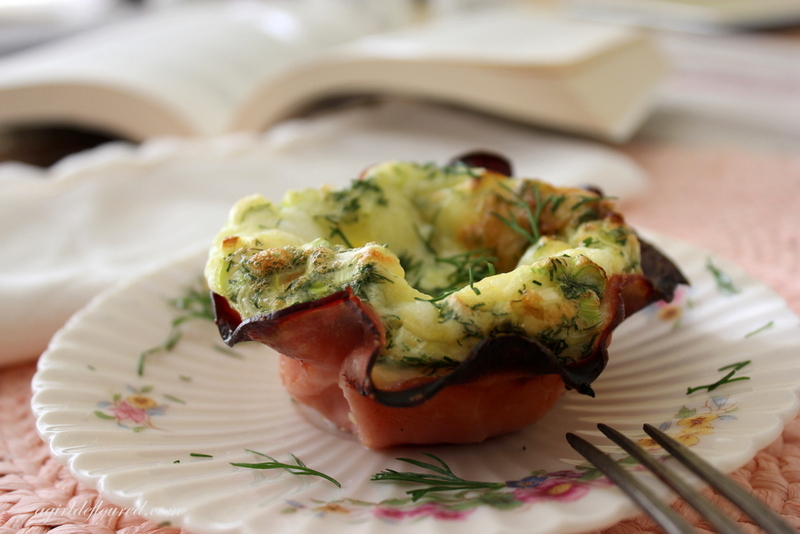 As these ham and egg cups were cooking they filled my kitchen with the most amazing and cozy aroma of baked ham. They came out of the oven gloriously high and mighty, then settled into a relaxed, slumpy state…much like our Sunday mornings. I loved them. So much, in fact, that I think I’ll make them for Easter brunch (and probably just for myself before that too). 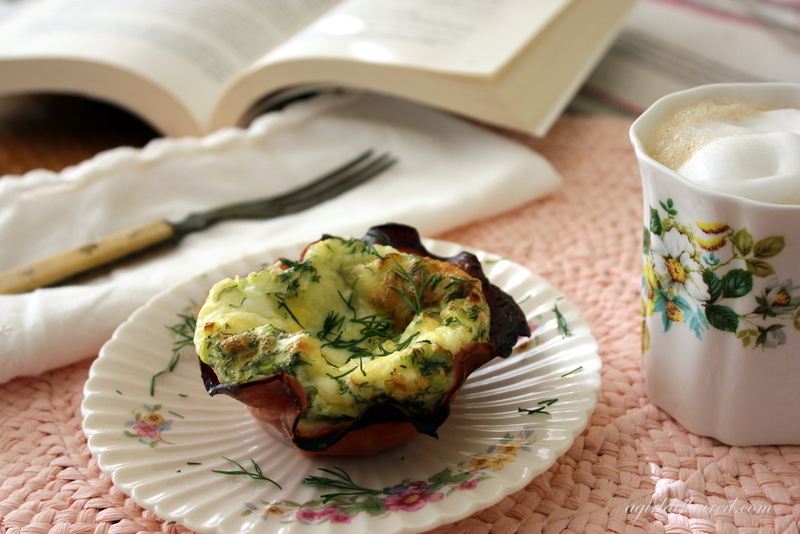 I decided to call them Danish Ham and Egg Cups, because the flavor profile–dill & havarti cheese–reminded me so much of my Danish grandfather. So tell me, how do you like your eggs? Preheat the oven to 400 degrees. 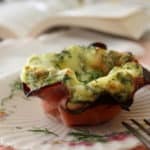 Spray 6 compartments in a muffin pan with gluten-free cooking spray. Gently line the tin with the slices of ham, creating a bowl shape. Set aside. Beat the eggs lightly with a whisk. Whisk in the cheese, crème fraîche, scallions, dill, salt and pepper until evenly combined. Pour the mixture evenly into the prepared ham cups. Bake for 25 minutes until the eggs are puffed and lightly golden brown (and cooked through). Let cool in the pan for 5 minutes, then gently lift from the pan and serve immediately. Garnish with extra dill if desired. This entry was posted in Main Dishes, Recipes, Recipes & Techniques by Cooks We Love and tagged A Girl Defloured, Alison Needham, autoimmune disease, celiac, celiac disease, celiac health, food allergies, g-free, g-free diet, gluten allergy, gluten free, gluten free baking, gluten free cooking, gluten free diet, gluten free dining, gluten free food, gluten free health. Bookmark the permalink.